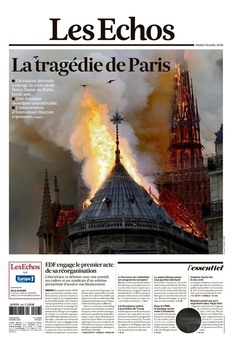 Horrific scenes from the heart of Paris tonight as the 850-year-old Gothic Notre Dame Cathedral collapses in huge fire. 400 firefighters on scene huge crowds gather and gasp as top spire collapses engulfed in flames. Terrible disaster, but not as completely catastrophic as it looked, thank God. 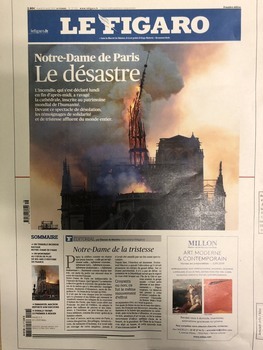 If you look carefully at SrceSrbije's pic above, the burning remains of the roof are resting on the top of the stone vaults, and the interior of the cathedral below is not burning. 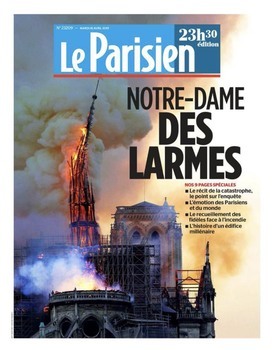 Today's BBC coverage shows that the falling spire smashed right through to floor level, and it looks like there's at least one other hole in the vault, but the firefighters were able to prevent the burning debris setting the whole interior in flames. So there will be smoke and water damage but that's mostly repairable (though it's a skilled, painstaking and expensive job) - the superb stained glass windows, most of the internal fittings, and the stone structure below vault level seem to have survived. The damage is bad enough, but at least it's not the complete disaster it sounded like last night.